Learn the specific details regarding a major insurance company undertaking a complete energy efficient lighting upgrade within its headquarters facilities. Download the case study to find out how! Eco has successfully completed over 50 projects involving the diverse facility spaces of the Financial Services and Insurance sector. 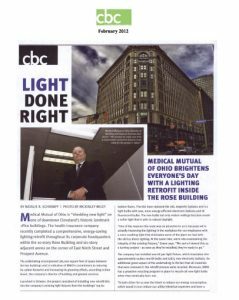 These projects have ranged from simple one-for-one lighting upgrades in a single facility to complex, campus-wide re-designs of a headquarters facility or an entire branch network. Our experience offers some critical insights and key learnings about energy efficient lighting projects in the Financial Services and Insurance marketplace. While energy savings across all buildings may be the ultimate goal of Eco Engineering customers, our experience is that some buildings will easily meet financial payback criteria while others may not. Working with a central management team, Eco Engineering may be able to bundle several individual sites or branch networks together under one project to achieve a compelling overall return-on-investment. Prioritization of the portfolio over time can lead to a successful longer term program that achieves the sustainability and energy savings objectives of the client well beyond a single facility. All lighting projects being planned, implemented or completed across all properties are also centrally managed by Eco Engineering under a single Project Management function. This creates better coordination, tighter schedules, streamlined processes and leverages intelligence about the customer, the project, the specific properties and standardizes technologies for specific applications. On-going facility management and lighting maintenance are positively affected in a standardized design approach. We realize that common area solutions are more complicated than simple lamp and ballasts retrofits. That is why we tailor light levels to the current and future needs of the area. We choose the appropriate lamp, ballast and reflector configuration augmented by advanced lighting controls to meet your lighting needs while maximizing your savings and minimizing your long term maintenance costs. While much of the lighting consumption in this sector stems from office spaces and general HQ-type facilities, the diversity of space requires expert auditing to identify all possible energy efficiency gains. Branch locations are very different from HQ facilities. Call centers and data centers provide their own unique configuration of space and required lighting. We have successfully designed, installed and monitored usage in “penthouse” areas where heating and cooling systems or generators are located. We have helped clients identify added benefits in janitor and supply rooms, storage rooms and electrical closets. Finally, the potential associated with outdoor lighting components, including parking garages, can add substantially to the overall project energy savings and ROI. The additional savings from examination of all spaces where lighting is consumed could make or break the final financial analysis and estimated payback calculations. Eco Engineering takes a comprehensive approach to safety and security when working in the Financial Services sector. Minimal disruption to work efforts means that people, materials, computers, furniture and other “obstacles” are often in and around the lighting work area. Potential safety hazards and/or damage to furniture, carpeting, walls or items left on desks are everywhere and even though lighting projects are not inherently dangerous, we prefer to practice caution. Our employees and contractors are trained in front line safety, including taking the time to do the work right, and our operating procedures reflect redundant practices. The additional security requirements in financially sensitive areas like vaults, branches and teller windows require special procedures and assurances often not found in other facilities. The financial commitment for a lighting project can be a substantial up front investment. Although the payback for the project is greater than the investment over time, coming up with the capital to implement multiple projects can be an obstacle. The financial services and insurance sector understands project financing and often seeks a lighting partner with similar understanding and flexibility. Eco Engineering maintains relationships with lending and banking institutions that can provide attractive alternatives including both on balance sheet and off balance sheet financing options for a project. Additionally, the specific regulatory guidelines for qualification to receive federal tax credits or local utility rebates are well known by Eco Engineering and can add a substantial boost to the payback and financing calculations.